We present an approach to multilingual information retrieval that does not depend on the existence of specific linguistic resources such as stemmers or thesauri. Using the HAIRCUT system we participated in the monolingual, bilingual, and multilingual tasks of the CLEF-2000 evaluation. 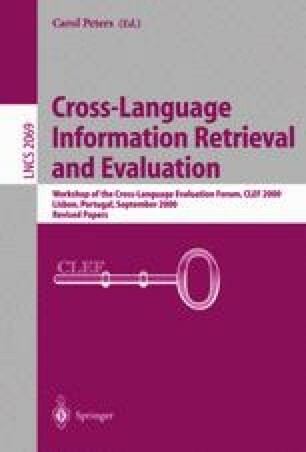 Our approach, based on combining the benefits of words and character n-grams, was effective for both language-independent monolingual retrieval as well as for cross-language retrieval using translated queries. After describing our monolingual retrieval approach we compare a translation method using aligned parallel corpora to commercial machine translation software.